Does your smile need a touch up for a big date coming up? Or what about for that job interview? Well, cosmetic and general dentist Lynn Griebahn, DDS, at Main Family Dental Care in Davenport, Iowa, has you covered. With comprehensive teeth whitening, Dr. Griebahn can brighten your smile several shades and give it the shine you’ve been searching for. To learn more about safe, simple teeth whitening, call Main Family Dental Care today or book an appointment online. Teeth whitening refers to the process of bleaching stains on your teeth to give them a whiter, brighter appearance. When applied to teeth, a powerful, professional-grade bleaching agent breaks apart the concentrations of tooth stains. This makes discoloration on your teeth disappear. As safe as it is effective, teeth whitening is quickly becoming one of the most popular cosmetic dentistry procedures today. It’s one of the best and least invasive ways to enhance your smile. Teeth whitening can deliver incredible results, brightening your smile by several shades and giving you a boost in self-confidence. Also, over time, wear and tear can lead to the erosion of tooth enamel, the white outer layer of teeth. This wear and tear can lead to yellowish teeth as the dentin — the layer beneath the enamel — becomes more prominent. 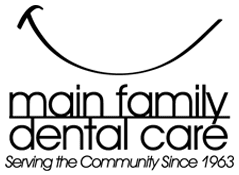 At Main Family Dental Care, Dr. Griebahn specializes in providing take-home bleach-lined whitening trays that allow you to brighten your smile at home on your own schedule. The bleaching agent, which contains the active ingredient hydrogen peroxide, is professional-grade and far more powerful than over-the-counter whitening options. In just a few short weeks, you can brighten your teeth several shades. You may experience some minor tooth sensitivity after wearing your whitening tray, but that should subside on its own very quickly. Provided you take excellent care of your teeth, your teeth whitening results should last at least 1-2 years, if not more. Continue brushing and floss regularly, and come in for dental cleanings to keep your teeth healthy. Also, if you want to be extra careful to maintain your teeth whitening results, try to limit your intake of teeth-staining foods and drinks. A low-sugar diet can help avoid unattractive tooth stains. Is it time to touch up your smile? Call Main Family Dental Care or book an appointment online today.